Lincoln And The Jews: A History, Jonathan D. Sarna and Benjamin Shapell, St. Martins Press, 2015, 272 pp., bibliographic notes, index, profusely illustrated with color and b/w photographs, $40.00. Having been a manuscript and letter collector for 35 years, Benjamin Shapell's interest has been absorbed by Lincoln more than anyone else. He has found among Lincoln's letters to be jewels 'having a poetic flair and marvelous turns of phrase.' Portions of his collection has been have been exhibited by the Library of Congress, the Smithsonian Institution, the New York Historical Society, and the Abraham Lincoln Presidential Library and Museum. In his collection of Lincoln documents he found Lincoln expressing humility, biblical imagery, compassion and respect for a people and a religion. 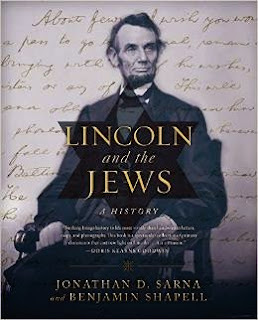 Jonathan Sarna, the author of When General Grant Expelled The Jews  and notes that Lincoln order expelling 'Jews as a class' from his encampments, Lincoln rescinded the order with the caveat "I do not like to hear a class or nationality condemned on account of a few sinners." The authors have found correspondence between Lincoln and five close Jewish friends and 14 among his associates and supporters. Lincoln appointed or pardoned 48 Jews during the course of his administrations. They also note that Lincoln also subtly changed his personal statements in response to Jewish sensitivities. As late at 1862 he described America as a Christian nation and a Christian people. By November 1863 he began to utter 'this nation under God.' Additionally, the authors examine anti-Semitism among Americans in general and abolitionists specifically. Lincoln And The Jews: A History address in the first three chapters Lincoln's upbringing, what he learned about Judaism for his readings of the Bible and traces his earliest Jewish friends and acquaintances in Illinois. In particular, the authors focus upon the relationship between Abraham Jonas and Lincoln during his campaigns for elective office. The middle chapters recount the role Jews played in the 1860 presidential campaign and during the presidency. Lincoln's decision to appoint Jewish chaplains and Grant's Order 11 are thoroughly examined. Issachar Zacharie, Lincoln's foot doctor, along with General Meade and his order to execute a Jew, two Roman Catholics and and two Protestants at Beverly Ford, Virginia are recounted and explained. The last chapter and the epilogue recount the assassination, the Jewish response to Lincoln's funeral and later memorializing. Also discussed is Mary Todd Lincoln's 1866 recounting that her husband remarked that he wished to Palestine and Jerusalem after his second term of was completed.